Brookfield Central basketball coach Dan Wandrey has had many talented players over the years on his girls and boys teams. But for the past three seasons, he has been pleased with the likes of Cole Nau, the Lancers version of a Swiss army knife. For those not familiar with a Swiss army knife, it is one of the handiness tools made. It has two blades, big and small, and some of the many additions include nail filers, fish scaler, scissors, pliers, Phillips screwdriver, tweezers, toothpick and can opener to name just a few. Wandrey can call on Nau to do several duties on the basketball court, just as easily as people can use a Swiss army knife for various functions. Just listen to how the veteran coach responded when asked about Nau's strengths. "His biggest strength is he doesn't have one thing that's better than anything else," Wandrey said. "His court awareness, his basketball IQ and acumen are outstanding. He plays every position on the floor for us. He handles the ball, he posts up. he gets the No. 1 defensive assignment. His versatility is irreplaceable. He really makes the players around him better." But what really makes Nau valuable is his ability to play defense. "He can guard 6-5, 6-6 guys," Wandrey said. "Obviously we're a little vertically challenged. With Cole's length and athleticism he can play guys who are bigger. And with his quickness and athleticism and anticipation he can guard smaller guys too. It's great." When asked if he liked guarding the other team's top player, Nau had an interesting response. "I like it because I like controlling one of the best guys in the game," he said. "If someone else is guarding the best guy, it kind of makes me feel weird. I like having an impact, I like playing the game both ways." 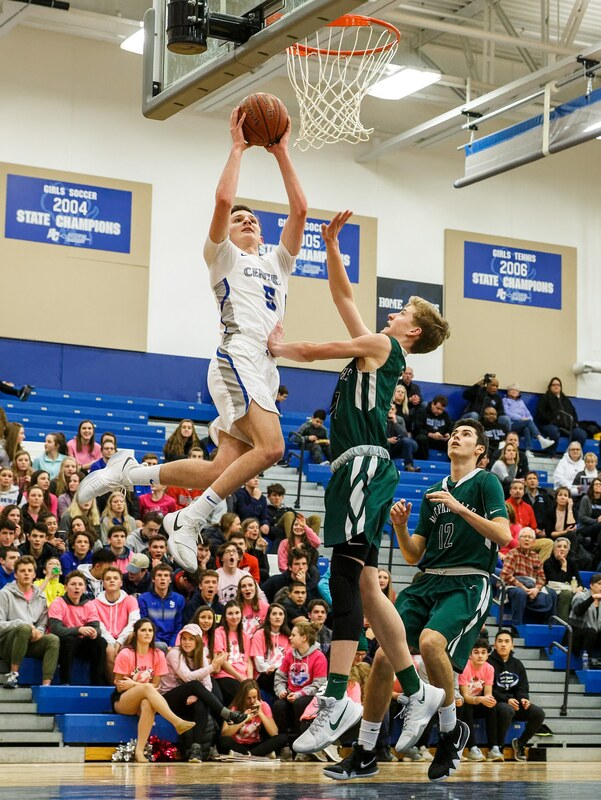 Photo by Al Herzberg, SportsPhotoLLC --- Junior guard Cole Nau does it all for the Lancers and is one of the major reasons for winning another Greater Metro Conference Championship. Cole is listed as a 6-foot, 3 inch guard, but he can pretty much play any position. And his regular season numbers are just as impressive. He finished second in scoring (13.3 points per game), 3-point shots made (28), rebounding (5.1 per game), assists (4.2 per game), steals (27) and blocked shots (14). He shoots .467 percent from the field, including .522 from the free-throw line. But where Cole really stepped up was a 4-game stretch - including 3 Greater Metro Conference games - when four Central players had to sit out because of an off-the-court situation. Nau was the key to keeping the Lancers in the conference race by leading them to a 3-0 mark against Menomonee Falls, Germantown and first-place Brookfield East. In a 91-60 win over Falls, he scored 21 points, handed out 10 assists, grabbed 7 rebounds, blocked 5 shots and had 3 steals. In a 79-53 win over Germantown he scored 16 points, had 10 assists, 3 rebounds, 2 steals and a blocked shot. But then in a 53-44 win over then undefeated Brookfield East, he scored 21 points, grabbed 8 rebounds, had 8 assists, a steal and a blocked shot. He scored 58 points (19.3 average), handed out 28 assists (9.3), grabbed 18 rebounds (6.0) and had 7 blocked shots and 6 steals. He also hit 22 of 42 shots (.524 percentage) from the field and ran the Lancers offense. 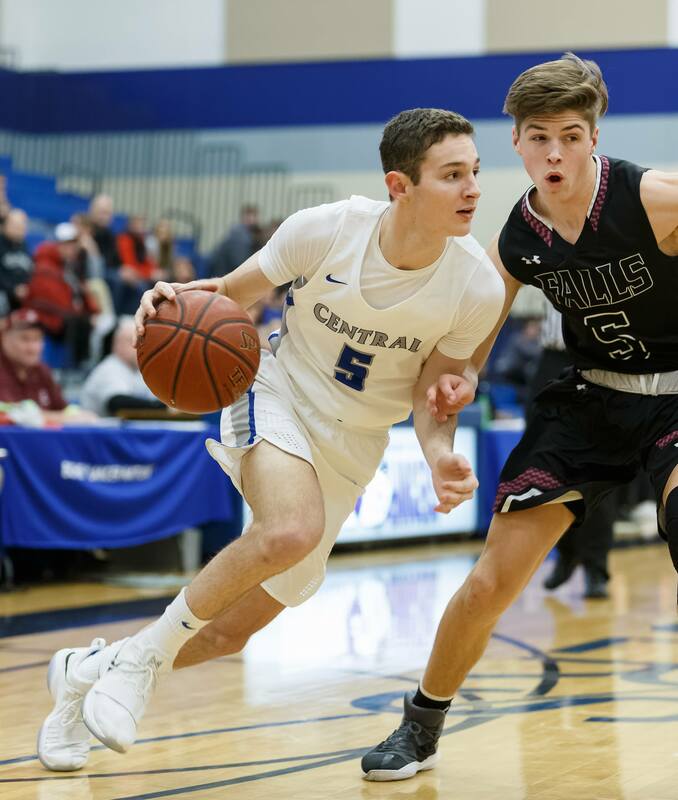 He even scored 17 points, grabbed 6 rebounds and had 3 assists in the only loss in that stretch, coming against state-ranked Sun Prairie in the Luke Homan Memorial Tournament. Wandrey was asked if he stepped up his game during this stretch when the team was short-handed. Photo by Al Herzberg, SportsPhotoLLC --- Brookfield Central junior Cole Nau tries to stay out of the spotlight . But this season the Lancers captain helped led the team when they were short-handed, winning 3 key games which enabled them to win another Greater Metro Conference title. "That doesn't even do it justice," the emotional coach said. "He was like out of this worldly. The first game he had almost a quadruple double. 21 points, 10 assists, 7 rebounds, 5 blocks. The game was like his chess game. "He did things. Cole brought those guys in gym (the players who started instead) early and went over things so they knew what to do." Cole also talked about having to step up his game. "I felt a little pressure, but when I got on the court - I play point guard with my Ray Allen select team and I really enjoy it," he said. "Jack (Brady) really stepped up. He's like Sam (Rohde) a lot, so I got him the ball." Brady a sharp-shooting senior also did a good job in that first game with 6 treys for 24 points. He also had 7 treys against Germantown for 25 points and continued to start the rest of the way, leading the team with 35 3-point shots. Cole talked about his role on the team. "I like to be a facilitator," he said. "I have to rebound and play defense too. A lot of things. I think my strength is seeing the court and seeing the court well. Looking for other teammates to score and knowing to score when you have to." The scary part if both Cole and Wandrey know he can get better. "Attacking the middle more, dribbling by guys, making more moves, having more counter shots stuff like that," Nau said when asked what he would like to get better at. "I want him to play like the guy who played 5 games when those guys were not available," Wandrey said. "He just has such control of the game when he's involved in it. He's never going to be a guy who is a volume shooter. He's not going to take 15-16 shots a game - it's not in his makeup. "When he needs to take control and be assertive, he's special. He's unbelievable. I would like to see him be that a little more. I want to say he blends in, but I don't mean it that way. He's OK with someone else taking the spotlight. but when he needs to, he's outstanding." Cole is the Lancers captain and he talked about his role. "I think leadership takes the team from good to great actually," he said. "Teams that have leaders can excel off the court and on the court. I like to be the kind of leader to talk to you when you need to be talked to, but I don't want people hating me. I want people to like me. But if I have to do something and make a tough decision, I'm not afraid to go that way." Wandrey agrees with Cole's assessment. "Cole is, I don't want to say soft-spoken - because that would indicate he's shy - but he's a man of few words," he said. "When he does speak, he's very poignant, it's very on point. He's that kid whose actions on the court, off the court - his work ethic, his commitment his dedication - makes him a great leader." Cole has a first this year - playing with his brother, Ben, a 6-0 freshman point guard. "In an official game, no we have never played together. I played with Gage (Malensek) in Jr. Lancers and we won state every year. I like it a lot (playing with his brother). It's really cool. Our parents really like it too." Wandrey was asked about Cole away from the court and he was very complimentary. "He is almost like that kid you'd want your son to be like," Wandrey said. "You'd want your daughter to bring a guy like him home. He has high character. He's hard working. The kid next door. Respectful gracious." Wandrey knew Cole was going to be good when he saw him play in third grade. "I was coaching the girls and we couldn't use our gym so we played at a church," he said. "He was in there with his dad and a couple other coaches playing on an AAU team. "He looked like a 15-year old basketball player in a 7 year old's body. That's when I knew he was something special." FAVORITE MOVIE: 'Stepbrothers,' Action movies. MOST MEMORABLE MOMENT: Going to the state tournament as a sophomore. WHAT DO YOU WANT TO DO IN THE FUTURE: Attend college, play basketball and study Business.